Thanks, I'm really happy to know that folks find my work useful. Monday could be a 3 gap play down to 2073 - now that's a great call! thanks. but what happens before that, have no clue how deep we can go, no need to say anything if the sentence includes "if....or"
Good call, i think selloff was pretty decent in size, new ATH i can only wish for now. Which way does such a purple pattern break...or is the right thing to wait for a move to one of the Lines and then bet on.a move in the other direction.. Funny Stanley cup Sharks lost it last night and this pattern implied a "hockey stick". Only at the time I drew purple lines, did not like it without a long stick handle, like flag without pole, so didn't expect a snap UP immediately. Yes, one of the lines should revert VST. Looks like it's the 5th time trying to break 2085. 5th time is usually a charm right? Right again, better than RO4! though i didn't see clearly 5 tests, but close enuf. 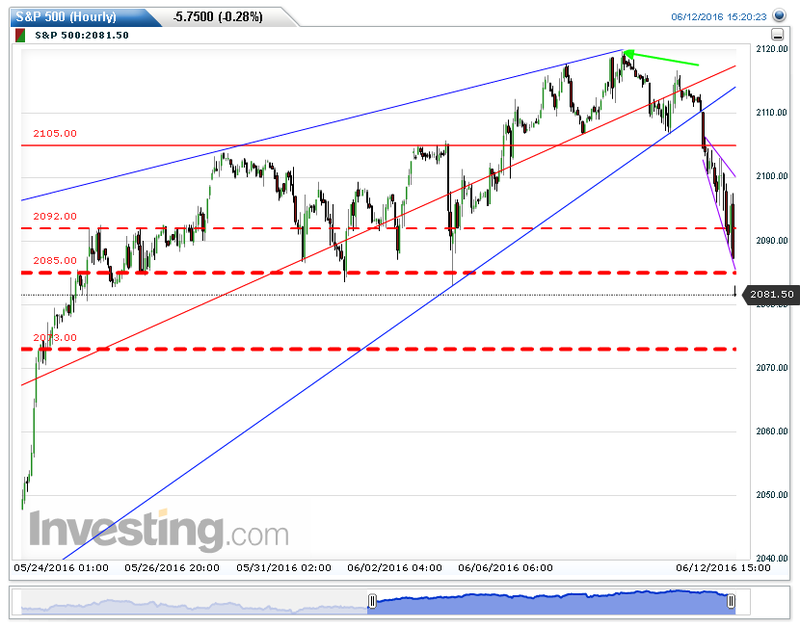 I make a refinement to my trend lines on SP500 MACD. The downtrend line in MACD in the first similar period was broken to the upside in the terminal move up (ends at "C"). That terminal move established a new more shallow downtrend line that took MACD down to the exact point of the 3 year MACD megaphone resistance line Jan 20 (labeled "D") - it then later put a cap on the middle of the "W" in the bounce off the bottom. In the current analog move, MACD broke the down trend line to the upside in a similar fashion, and as of Friday turned down again (see 2nd "C"). 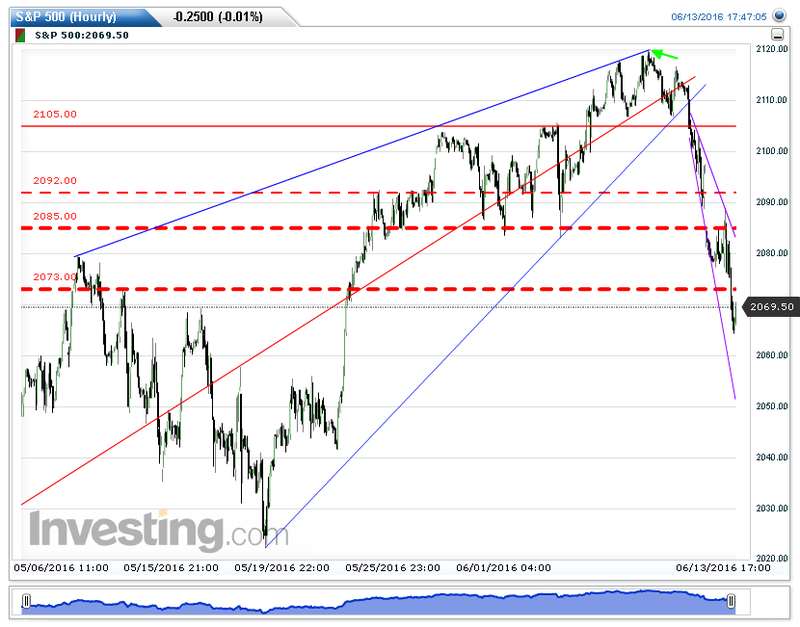 If it continues on the same path, well you can imagine what it will mean for the SP500 level. Great MACD watch and approach, thanks! yes If it continues on the same path, well you can imagine what it will mean for the SP500 level. Only that RSI did not hit 70, and 50 MA is way higher this time to cross down, and 200 MA rising. Also, coming Friday quadruple witching. Last Friday is JUN roll out day, Investing.com started streaming new SEP contract data on Sunday. Only for a moment Sunday 3:20 PM, they showed a chart all in Sept, including last Fri's close of 2087.25, at the time the last was -5.75. From then on they combined June and Sept contract in one chart that still shows Friday closed at 2095.75 JUN. This created an 8.50 pts extra 'chart real state gap' on top of actual open down gap... so whatever last price you see, add 8.5 to it for the actual chart real state loss from JUN to SEP. Translate into chart reading technique, means we can truncate 8.5 pts from the gap before drawing the lines for pattern. When 2105 gives, first BD target 2092, then Dunk Zone 85~73 (coming and going). I was busy out today, preset stop below 2073 and cashed out. The pullback's a little too sharp/quick. Opened up for possible 2050~60 touchdown before a bigger bounce to begin; since the Purple Hockey stick is more like old friend Descending Megafon now! Also watching for possible 2073 retake for a sooner bounce to trigger. Edited by iloli way, 13 June 2016 - 08:58 PM. This Monkey Relax is currently half position Short from 2097.5...2105 never got filled ( Due to my losing tradefrom the previous 2 weeks... I had to happily take the 24 points at 2092; otherwise I'd be at full position short now). I was planning to cover at 2072, but I dont like whats happening in europe and this could get very ugly today; so I remain net short. I think 2072/3 will be a temporary pause today. Edited by salam, 14 June 2016 - 05:02 AM.